Little Frog wraps are available in multiple lengths. 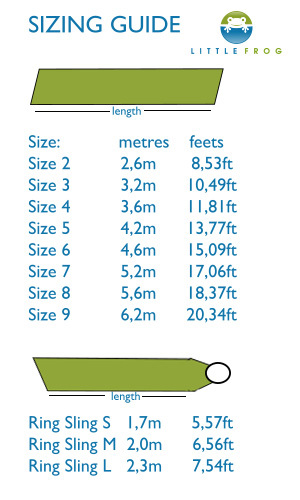 Choose what length suits your needs. There are several ties. You can carry your baby multiple ways in the front, as well as on your side and back. The longer the wrap, the more options you have. It's always best to fit the length of the wrap for the person who will most often carry the baby. Others will be able to use the wrap one way or another. But it's always about it's length. Check the table provided below for guidance and suggestions. Note: Little Frog wraps come bit longer due to the fact they shrink slightly after the first washing. If you have any doubts - contact us, we will be happy to help you.